[12-5-2007] At the time I created this page no one had a real Pleo to review. A few days ago Ugobe sent me a review unit and I am delighted to announce that I have written a real review now. Click here to read that review which is on my Pleo blog. Then come back to this page to learn more about Pleo. So with that in mind, read my �almost a review� below. 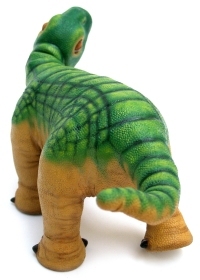 If you have not dones so yet, click here to read my actual review of Pleo now that I have had one for a few days. You can also read our Pleo Reviews page to see what those lucky premier technology web sites had to say about their visit from a real Pleo, and real Caleb Chung and Bob Christopher! Caleb�s experience as an entertainer, especially as a mime and an actor, have been crucial in shaping Pleo. Ugobe cares passionately about Pleo and are willing to do whatever it takes to meet the enormous expectations we all have for Pleo. Caleb�s relentless drive to make �life from scratch�, is the spark behind every endearing life like movement and trick Pleo performs. Those authors whose articles went into depth about Pleo, Ugobe, and Caleb, which you can find on the Pleo Reviews page, are universally impressed with the deep and revolutionary technology that is behind Pleo. More importantly, they are impressed with how invisible that technology is. I, and I believe you, don�t want a pet robot, I want a pet and Ugobe intends to give us one. In conclusion I would like to make this one important point. When I see Pleo I see the living incarnation of one man�s supreme desire to bring a little magic, real magic, into our world. I can see in Pleo�s big blue eyes and shy clumsy gait a little bit of Caleb looking back at us and I can almost hear a small voice inside. A tiny voice that sings the most enchanting words that all of us, especially adults, yearn to hear: �Play with me!�. Be sure to bookmark this page (Ctrl-D) and subscribe to blog, the instant I get my greedy hands on a little Pleo I will be keeping a web diary about my experiences; you should keep one too!